We ask for a $20 donation to unlock all the features of the software. To use PayPal, select "PayPal" during checkout. Unlock code sent via email to unlock trial. All donations go to keeping this project alive! 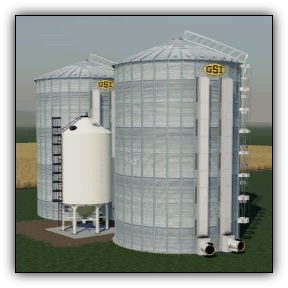 All-in-One FS19 game enhancement software. Runs on any version of Windows. 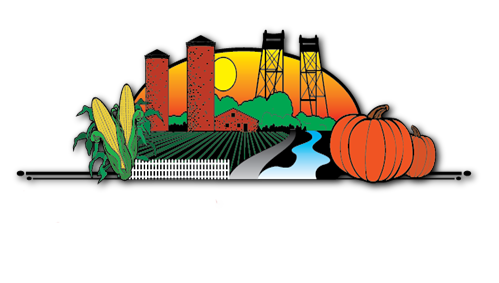 launch FS19 from within the program. 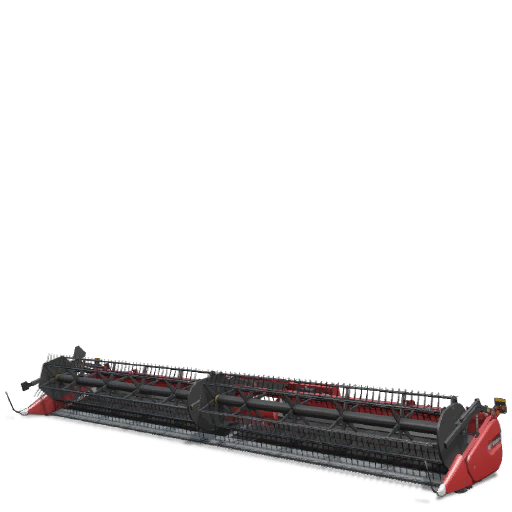 There is a lot of equipment available for FS19. The Equipment Database helps to keep track of it all. Looking for a specific model? Use Quick Search to find it fast. Plus you can create and print an equipment report. Selecting a record to include in the report is as simple as checking a box, or one click selects all. You can also track whether it has been reviewed or not (real handy for the youtubers). 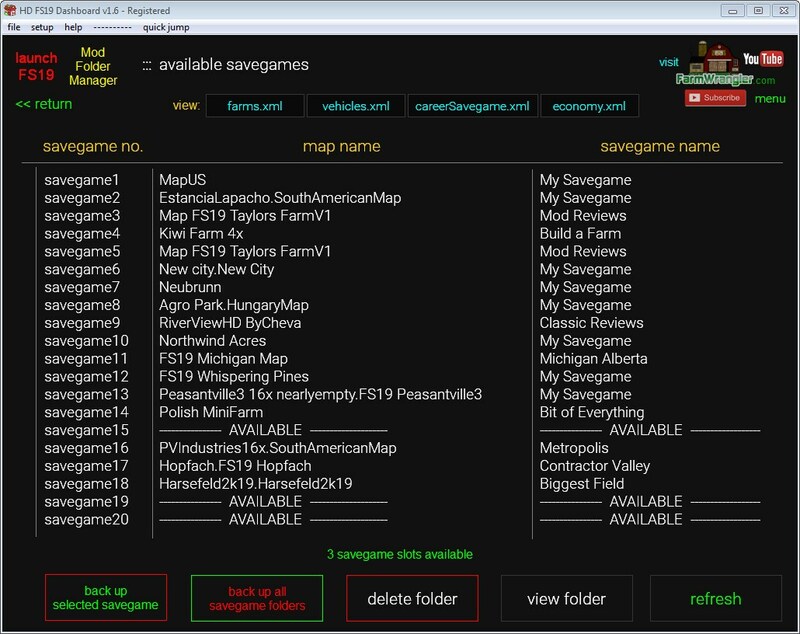 Available savegames will tell you which savegame slots are available in the game. Allows you to view the savegame folder in Explorer. Once a savegame is deleted or corrupted, there is no getting it back. It is important that you backup your savegames often, especially after a game session. This feature allows you to backup all your savegame folders to a location of your choice. It also backs up the savegamebackup folder, if available. Once you select a backup folder, the program will remember it until you decide to change it. Keeping all your maps and mods in the default mod folder can cause conflicts due to map bleedover, meaning your maps won't load or can cause the game to crash while playing. Keeping each map and it's mods in a seperate folder will eliminate these problems. Mod folder manager makes it easy to keep track of these folders, and will tell the game which folder to load when starting, even those on a removable drive. Using it is easy. 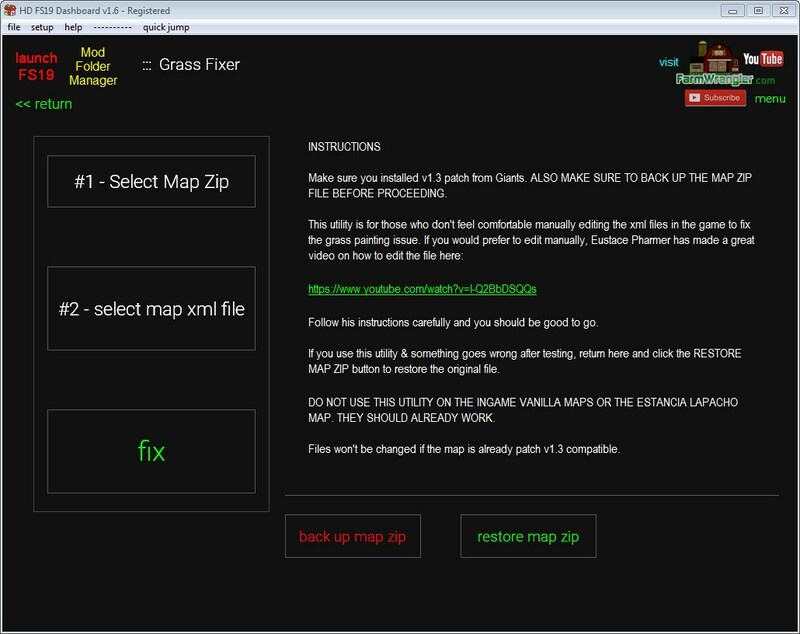 First, create a folder anywhere on your hard drive and copy the map file and the mod files you want to use into it. Now open up mod folder manager and set up a button for that folder. You can save up to 40 maps. 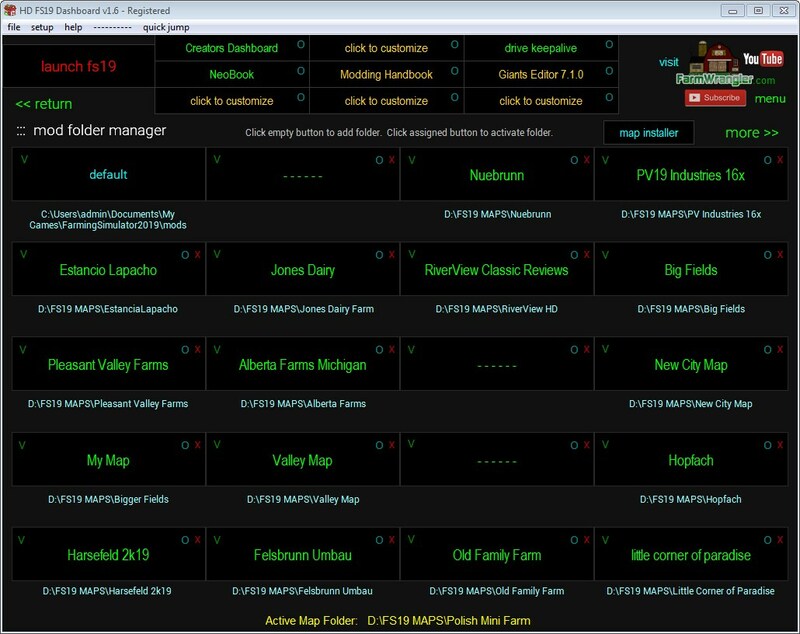 When you're ready to play, just come to mod folder manager first to select the map you want. This action will delete the selected savegame folder, making it available to the game. You can also view any of the games' configuration files. 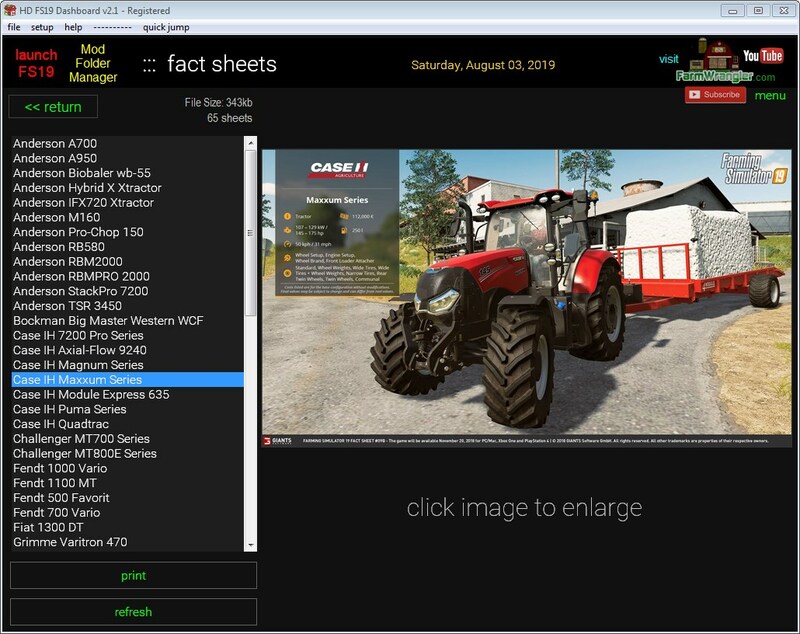 48 full color fact sheets for FS19. You can also add your own sheets. Just drop them into the factsheets subfolder and click Refresh. You can also print out any of the sheets. Then launch the game. The game will retain this setting until you change it by clicking on or creating another button. 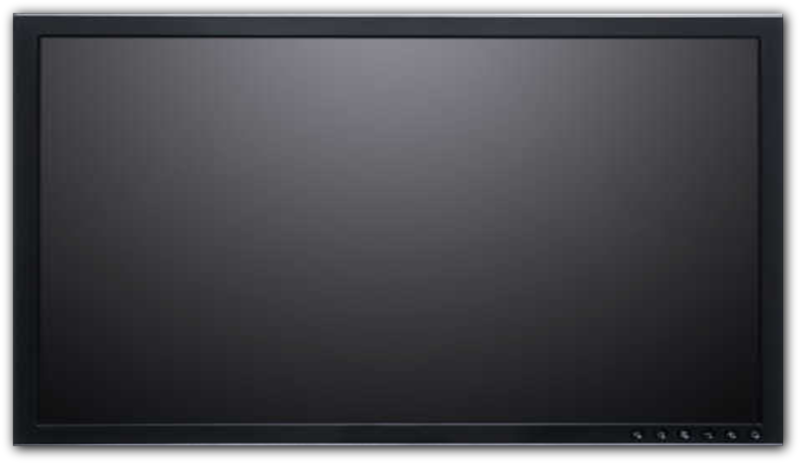 Has 9 programmable buttons to launch any other programs, such as gpu tweak, screen recorder etc. not included in the free version. 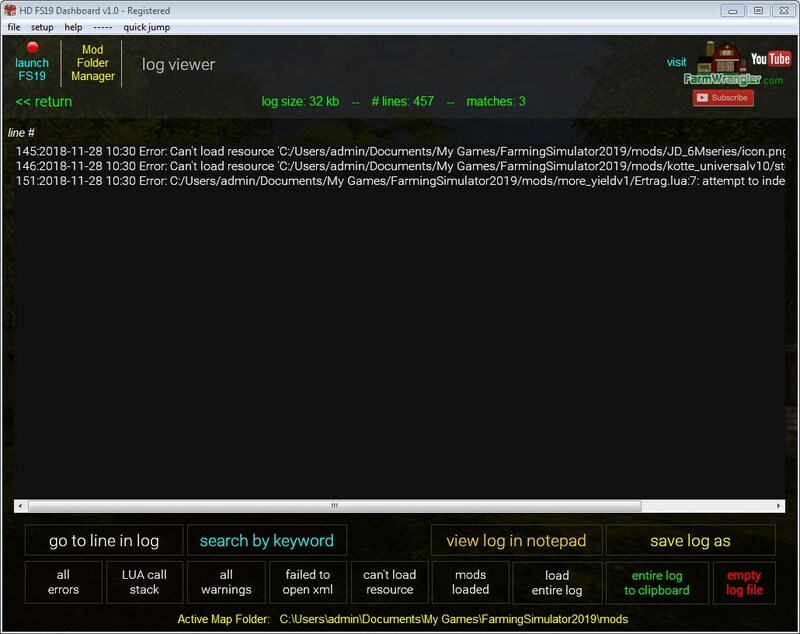 More than just a log viewer, this feature lets you search for just errors, warnings, failed to open xml, can't load resource, or load the entire log file. Also search for keywords. You can copy any line in the log or the entire log to the clipboard as well as empty the entire log. 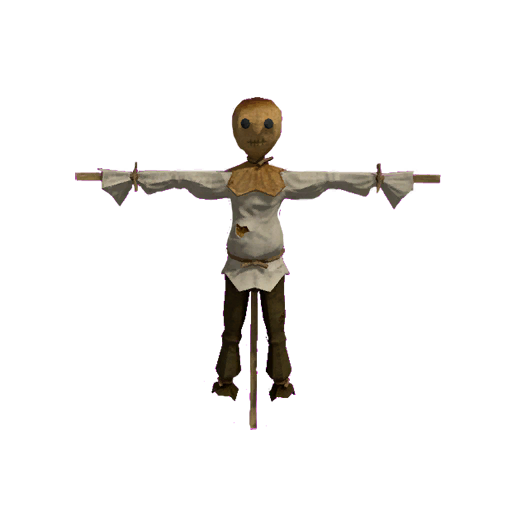 Handy for troubleshooting mod problems resulting from missing modDesc.xml files or missing resources or any errors causing the game to crash or lag. NOTE: We can't issue refunds once an unlock code has been issued. We are providing a 10 day free trial so you can determine whether you like the software before you donate. You need just enter the unlock code we will send you by email to unlock the trial version. Download free 10 day trial. Those who already donated for an unlock code need just download the latest version and install over top of existing installation. No data will be lost. 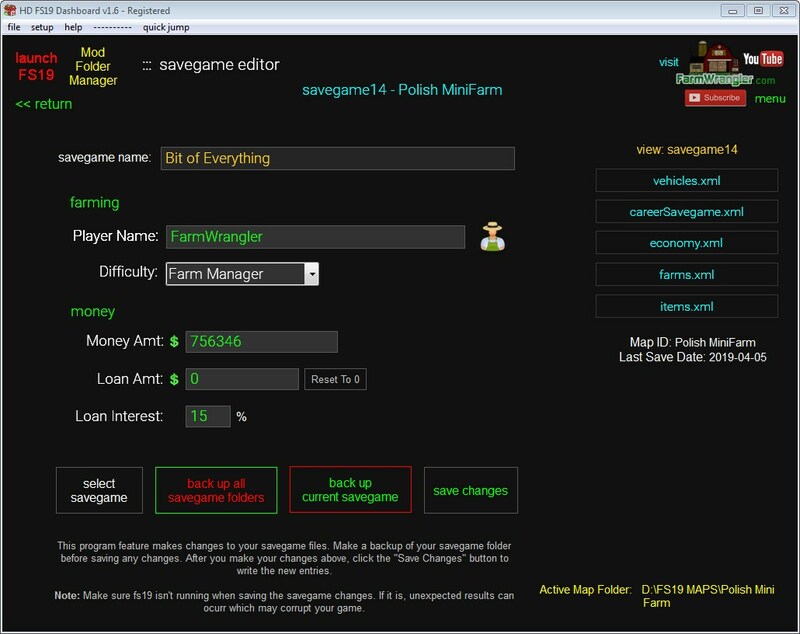 The Savegame Editor lets you configure many aspects of the game your way. - View/edit savegame XML files. 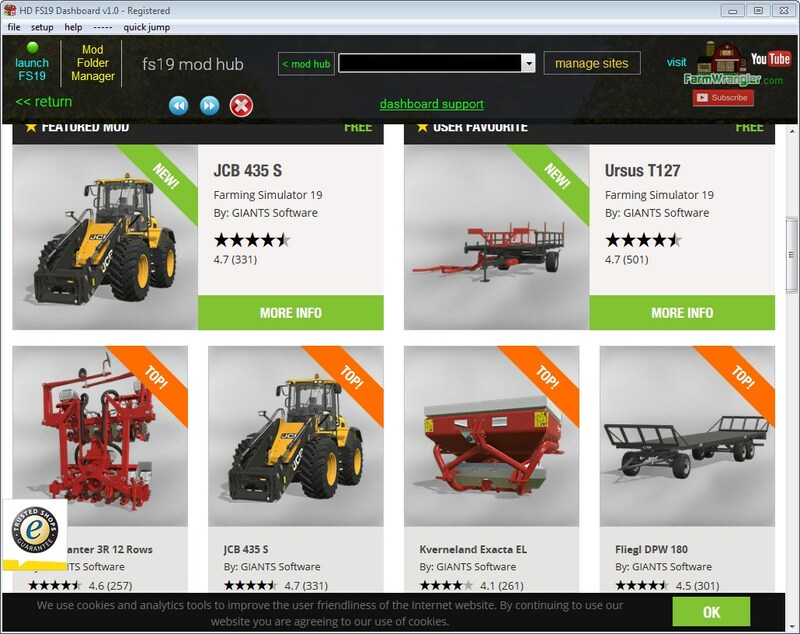 Access the Farming Simulator Mod Hub with a single click. Download your favorite mods and maps. You can also program an unlimited number of your favorite mod sites for one-click access with the Mod Site Manager. Display the stats for any savegame. Everything you need to know in one place. - Take screenshot of stats. - View PDA map of the current savegame. - List installed mods for savegame. 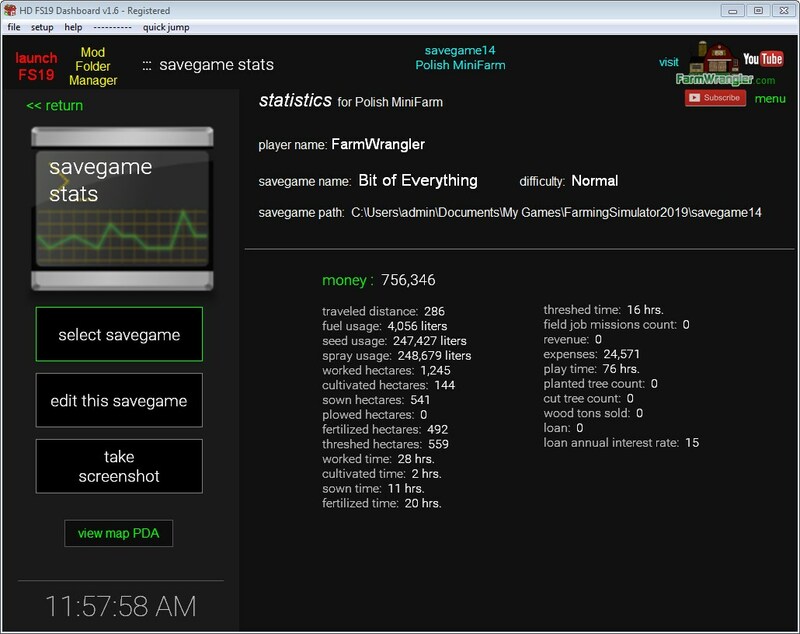 - Single click access to the savegame editor or mod folder manager. FIXED: In-game mod editor lists not displaying. Aren't happy with the number or type of train cars in a map? 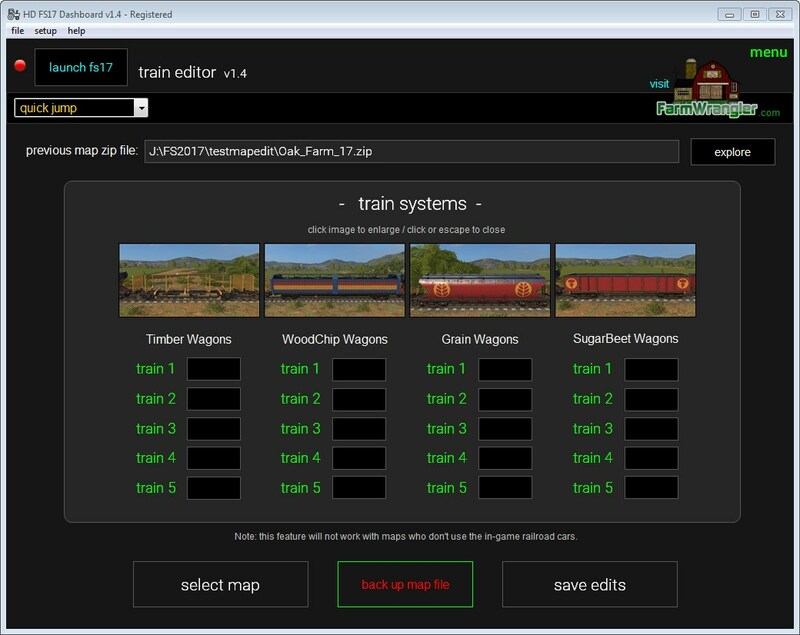 This utility allows you to edit the number and type of train cars for each train system installed in the map. 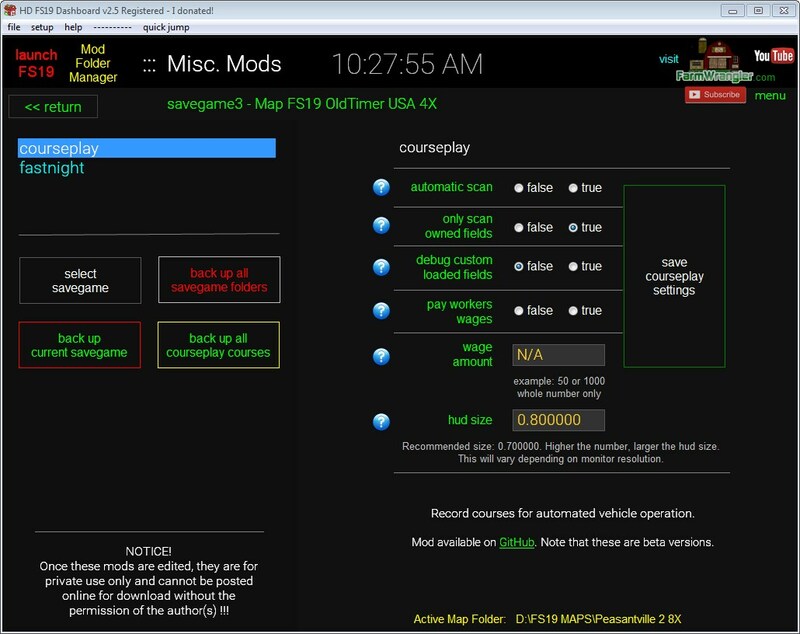 Simply select the zipped map and it will display the number of cars and type for each train. 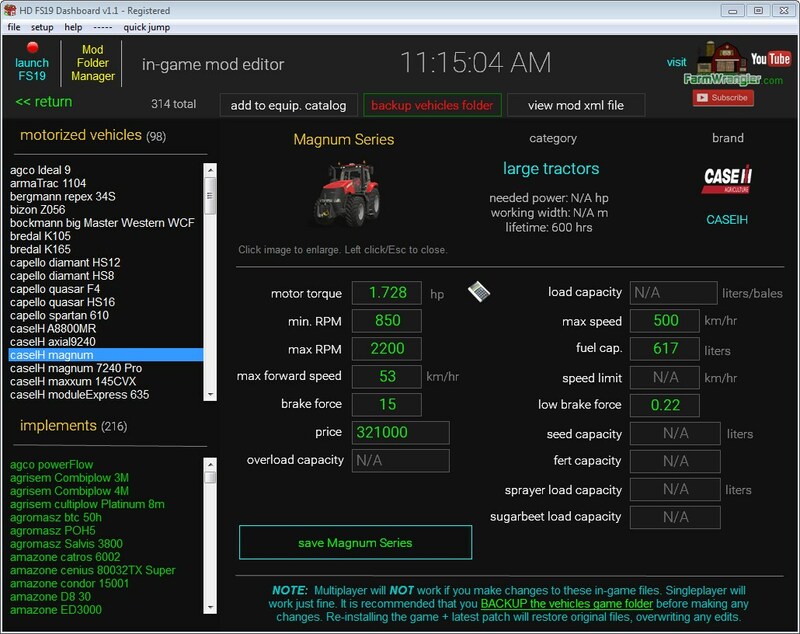 Then edit the amount for each car type and click Save Edits. That's it. Your trains will now be configured. Formally known as the utility mod editor, the misc. mod editor now has it's own screen where we will be adding more mods to edit as time goes by. You can edit select mods to help create a unique gaming experience and not have to dig through config files to get it done. You can edit the vehicle mods that ship with the game . A total of 314 store items. Tractor not powerful enough? Capacity too low? Price or daily upkeep too high? Need more fuel capacity? 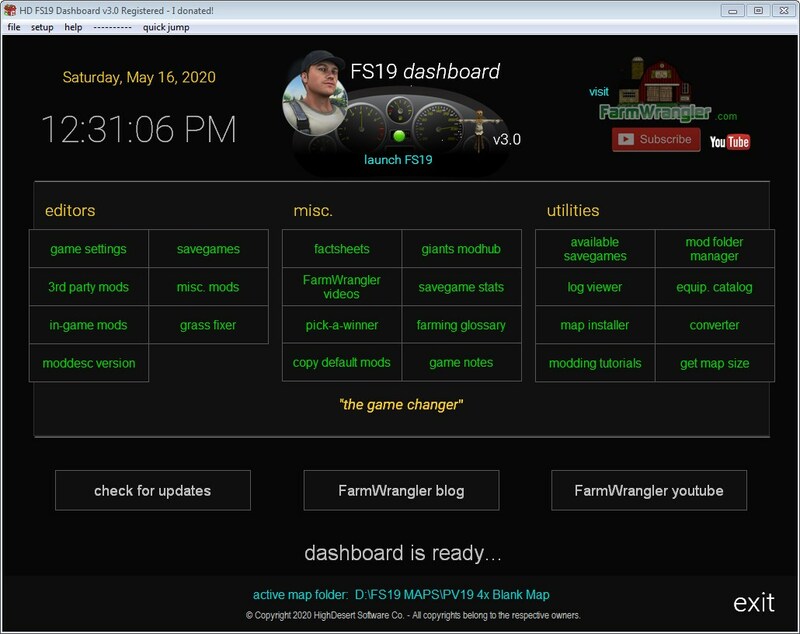 Edit these and many more specs with the FS19 Dashboard In-game Mod Editor. Make your edits, launch the game and see instant results. 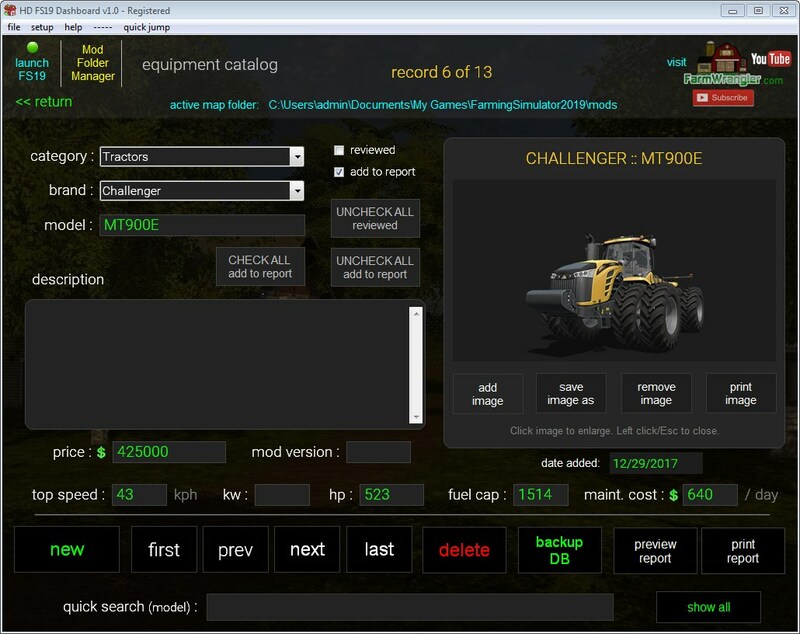 Edit horsepower (Includes horsepower calculator), RPM, forward speed, brake force, price, load capacity, max speed, fuel capacity, daily upkeep and much more. Download the trial and give it a test spin! 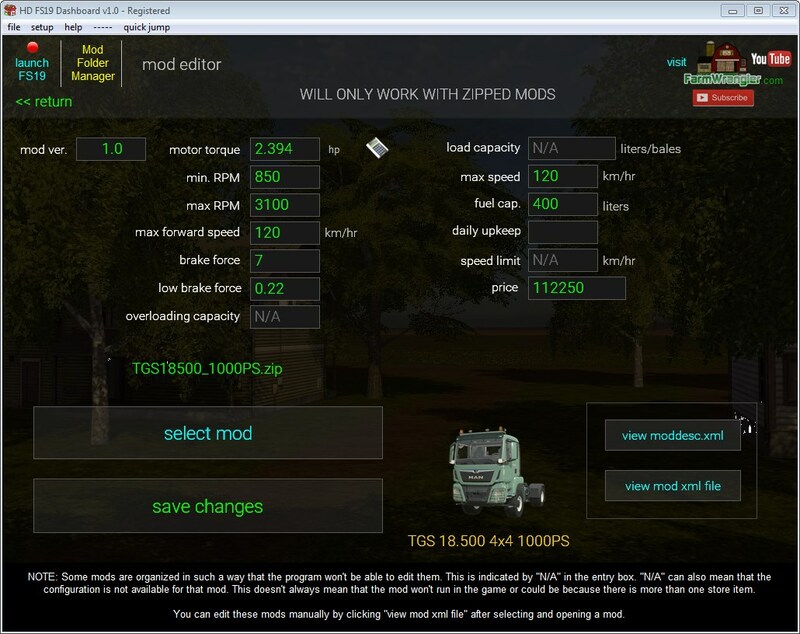 You can now edit the vehicle mods that you download off of mod sites. Tractor not powerful enough? Capacity too low? Price or daily upkeep too high? Need more fuel capacity? 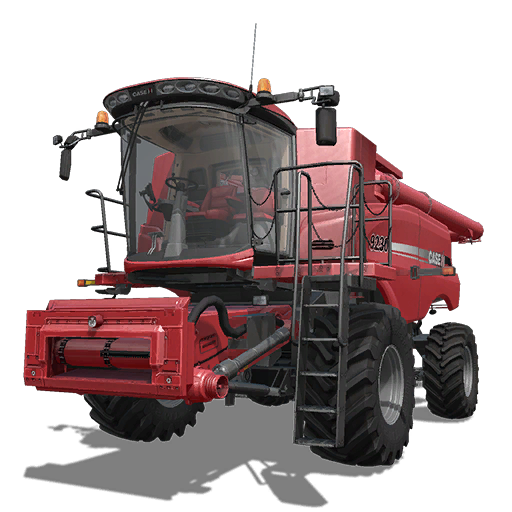 Edit these and many more specs with the FS17 Dashboard 3rd party Mod Editor. Fix the grass painting issue in FS19 with just a few clicks. This utility is for those who don't feel comfortable manually editing the xml files in the game to fix the grass painting issue. Files won't be changed if the map is already patch v1.3 compatible.